The name bagging comes from boostrap aggregating. It is a machine learning technique proposed by Breiman (1996) to increase stability in potentially unstable estimators. For example, suppose you want to run a regression with a few variables in two steps. First, you run the regression with all the variables in your data and select the significant ones. Second, you run a new regression using only the selected variables and compute the predictions. This procedure is not wrong if your problem is forecasting. However, this two step estimation may result in highly unstable models. If many variables are important but individually their importance is small, you will probably leave some of them out, and small perturbations on the data may drastically change the results. The Bagging solves instability problem by giving each variable several chances to be in the model. The same procedure described in the previous section is repeated in many bootstrap samples and the final forecast will be the average forecast across all these samples. In this post I will show an example of Bagging with regression in the selection context described above. But you should keep in mind that this technique can be used for any unstable model. The most successful case is to use Bagging on regression trees, resulting in the famous random forest. 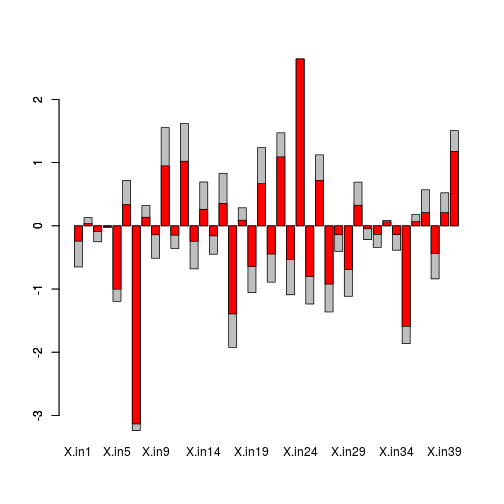 The Bagging is also very robust to over fitting and produces forecasts with less variance. in order to have many variables with small individual importance. , run a new regression with the selected variables and store the coefficients. smaller than the OLS. It is also interesting to see what happens to the coefficients. 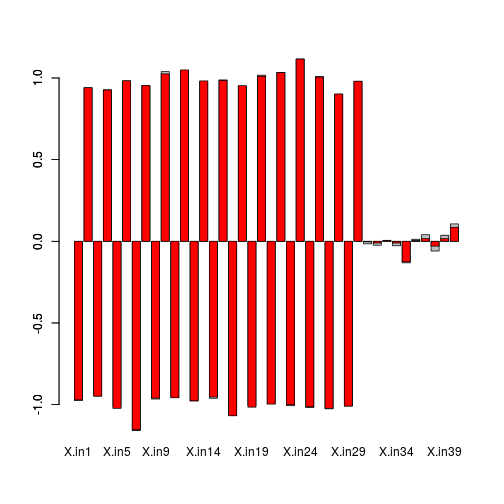 The plot below shows that the bagging performs some shrinkage on the coefficients towards zero. in the code erro = rnorm(N, 0, sqrt(2*aux)) in the dgp. As you can see, the bagging and the simple procedure are the same in the absence of instability.